Let's see......I support "Abortion, homosexual marriage and gay rights" and recently, while lying under my vehicle changing the transmission, had it suddenly fall on my face......AND RECOVERED!!! !.....ohhhh mee gawd. As far as Obama being the second coming....PA.LEASE.......All i can say is God help our country if he doesn't get reelected. I say GOD help our country if he does get relected. See we can all say what we believe. Thanks to our soilders fighting for our freedom. Which is what we may end up loseing if obama gets back in office. HOW will we lose our freedom if Obama beats Romney? Is Obama the second coming of what?Jimmy Carter? Not Jimmy Carter. Not one shot was fired during his entire Presidency. "What is "No" Alex." That is the correct answer to the original question in this post. I don't believe in any of this! "I know these are the last days ..."
Apparently, the reference is to a used-superstition salesman. According to that religious superstition, it would technically be a 'third coming', (having supposedly arrived, died and allegedly zombied back once already). Still, it's not likely that Obama is the third coming, (or fourth, or how ever many they imagine). Bahahahaha! Obama's nobody. He's merely a marionette whose strings are being played by Valerie Jarrett. 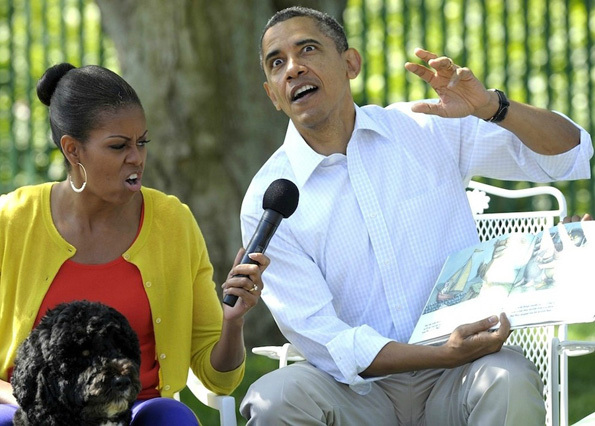 wow really you came up with pic of him reading a book to children and acting out the story. thats pretty low dude. hmmmf some people need to come out of they basement sometimes and join the real world. I know that Obama is not the second coming. He thinks he is but he only destroys lives and does nothing to help them. ALL his misleading talk about how everything he does is helping the country with unemployment and improving healthcare is a bunch of BULL. It was a joke and obvious sarcasm. Proof? Look at the source of where the picture came from.